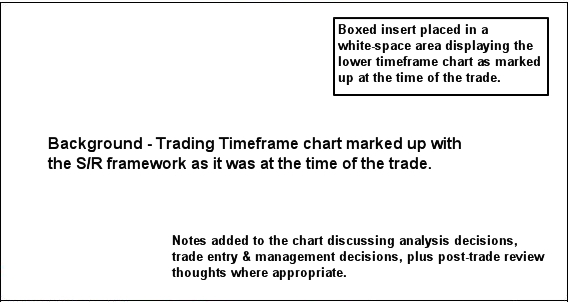 Volume five of the YTC Price Action Trader talks about trader development and how it's a result of deliberate practice methods combined with a Trade-Record-Review-Improve cycle. A key component of this is effective documentation and review. What I want to show in today's article is the way that Josh marks up his charts and saves them for future review in his Trades Journal. I think it's great. If you're not doing something similar… start it now! YTC PAT traders… analyse his trades as well (GBPUSD / TTF: Daily / LTF: 4H). Everyone else… just take note of the way that Josh documents his trades into a Trade Journal. Are you following a similar process? If not, why not? Start it now. The quality of your documentation and review ARE a good indicator of the degree of progress you can expect to make in your journey to becoming a professional trader.